Consider a collection of 802.11 access points. Each serves as the gateway to the Internet for clients in its WiFi cell. These cells have an arbitrary interference pattern, and reception at a client may be corrupted by transmissions nearby. The popularity of WiFi has made such dense deployment increasingly common. As interference can seriously degrade performance, there is much interest in optimizing the configuration of these cells. One factor to consider in optimization is channel share, defined as the useful fraction of channel bandwidth that an access point gets when there is downlink traffic saturation. Interference affects channel share on the sender side through carrier sensing and transmission deferral, and on the receiver side through collisions, which result in exponential backoff and retransmission. There exists a simple, “back-of-the-envelope” (BoE) technique to model the impact of pairwise sender-side interference. This paper tackles the harder task of determining the impact of receiver-side and non-pairwise sender-side interference. 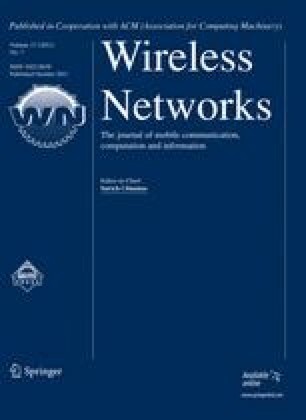 It proposes a technique for modeling the channel share of wireless links, and the accuracy is demonstrated with Qualnet simulation. Many thanks to Dina Papagiannaki, who hosted Tay’s sabbatical at Intel Research, Cambridge, where a simplistic version of the channel share model was first conceived. Meraki networks. http://www.meraki.com/. Accessed 20 June 2011. Qualnet simulator. Available from http://www.scalable-networks.com/. Accessed 20 June 2011.